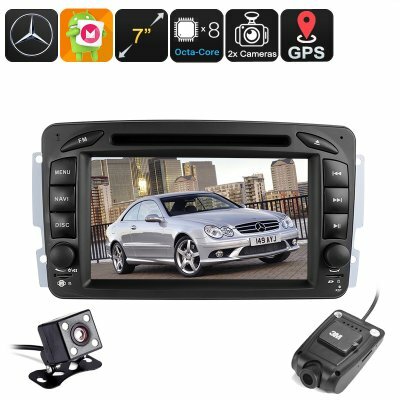 Successfully Added 2 DIN Android Car for Mercedes Benz - Region Free DVD, Dash Cam, 7 Inch touchscreen, Android 6.0, BT, Wi-Fi, Hands Free, DAB to your Shopping Cart. Put the power of Android 6.0 in your Mercedes-Benz with this Car DVD player. All-In-One car Stereo and Sat-Nav GPS navigation system. Specially made for the Mercedes-Benz Viano 2010, Mercedes-Benz CLK-Class 2003, Mercedes-Benz C-Class 2004, it brings state of the art navigational and entertainment to your luxury coupe. This touch screen DVD player is a great way to put the power of Android in your car. The region free DVD player supports all types of discs so keeping your passengers entertained on couldn't be simpler. Connect this in dash DVD player to head reset monitors and keep your children in the back occupied on long trips and even the school run. Meeting all the latest's in-car entertainment needs, this car stereo has optional DAB support, can connect to you iPhone or Android device via Bluetooth and has SD Slot as well as USB and Aux in ports. This Mercedes-Benz Navigation System provides turn-by-turn directions thanks to the built in GPS software and sensitive SIRF III receiver module. Just load in the Android Maps via a dedicates micro SD port and you'll never get lost when explo0ring a new city or state. AS well as providing excellent entertainment this car DVD player brings added safety to the roads. Hands free Bluetooth connectivity lets you sync it to your Android or iOS phone to enjoy hands free calls. You will be able to quickly navigate and see all your contacts as well as having a caller ID for inbound calls. CAN Bus and a smart learning means the steering controls on your Mercedes Bens CLK will work in harmony with the DVD player so you can swap tracks, select play lists and control the volume without taking your hands of the wheel. When it comes to audio output you'll enjoy stunning sound with 4 x 45Watt speakers and subwoofer supported. Load music from USB or SD card or and auxiliary input. Alternatively download content from online as this car stereo has Wi-Fi and 3G dongle (not included ) support. This 2 Din Car DVD Player comes with 12 months warranty, brought to you by the leader in electronic devices as well as wholesale car stereos..